Coming as little surprise to anyone thanks to a slew of previous leaks and rumors, Activision officially announced Call of Duty: WWII last week, confirming that its annual shooter is finally returning to the historic setting that made the series so popular more than a decade ago. Besides affirming what we all suspected, however, the publisher’s asking fans to wait just a few more days before the lid is fully lifted on this year’s iteration, although it looks as if many of the details it plans to share on April 26 may already be out in the open. As reported by CharlieIntel (via VG247), a collection of Australian marketing materials appears to have been leaked ahead of time, revealing some rather interesting nuggets of information, chief among them a worldwide release date of November 3. What’s more, it appears as if a so-called ‘Private Beta’ will be opened up to all who opt to pre-order the title ahead of full release. 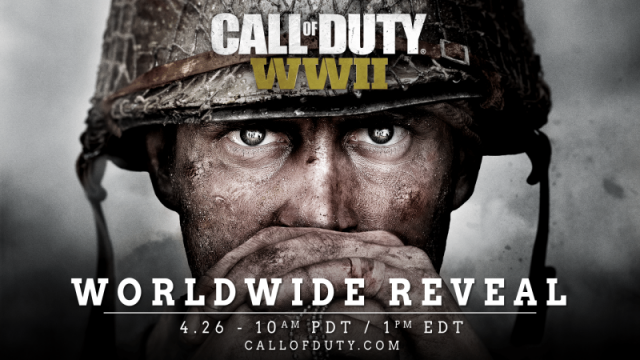 Adding to that are a handful of descriptions detailing the shooter’s campaign and multiplayer modes, the former of which promises to be a “breathtaking experience” that’ll whisk players away to experience pivotal moments in World War II, including the D-Day landings in Normandy and other “iconic locations in history’s most monumental war.” Not much is revealed in regards to multiplayer, although the description states that it will offer new and exciting ways for players to “interact and socialize” with friends and comrades in the Call of Duty community. Last but certainly not least, a new co-op mode is being thrown in for good measure, which aims to tell a standalone story separate from the single-player campaign. As always, one should take all of the above with a pinch of salt until it’s made official, but it all sounds (and looks) pretty genuine. All that’s left to do now is wait until Wednesday for Activision and Sledgehammer’s worldwide reveal. Keep those peepers peeled.